Hi everyone! Today is a super exciting day here on Pop! Goes The Reader and I can’t wait to share all the details with you! After all, what’s the fun in having a secret if you can’t share it with everyone? (Ha! I’m kidding.) (Mostly.) Anyway! After more than two months of planning and preparation behind the scenes, I’m thrilled to finally, officially announce that beginning tomorrow – June 1, 2016 – Her Story: Ladies In Literature is back! What is HER STORY: LADIES IN LITERATURE, you ask? Keep reading to find out! Her Story is a special event that first debuted this time last year, and is a project that is very near and dear to my heart. Of all the events, initiatives and projects I’ve undertaken throughout Pop! Goes The Reader’s three year history, it is also undoubtedly the one I’m the most proud of. As I wrote last year: Books offer readers – particularly young female readers – a great deal. Comfort. Hope. Inspiration. Joy. Representation. Laughter. Encouragement. Escape. Perhaps most importantly of all, however, books offer readers visibility and validation. It’s a special kind of magic to see ourselves and our experiences reflected on the pages of the books we pick up. Every reader deserves to know that their story has value, meaning, and is worth telling. In hosting this event, in encouraging others to share their stories and talk a little about the characters that have touched them the most deeply, my hope is to create a a resource of sorts, a list of inspiring, empowering and engaging female characters that young readers can use to help them discover the book that’s right for them. I would like to take a moment to thank all participants, both past and present, for their stunning contributions to this event. Her Story would be absolutely nothing without the participation of the authors who have graciously and generously donated their time and their talent to help make it a reality. The literary community is absolutely brimming with intelligent, creative, capable women whose stories are every bit as inspiring and valuable as those of the characters they craft. I feel unbelievably blessed by the support and friendship I’ve been shown throughout this process and humbled that the number of participants in 2016 has nearly doubled that of 2015. I would also like to thank Vicki Tsai, the phenomenally talented illustrator responsible for all of Pop! 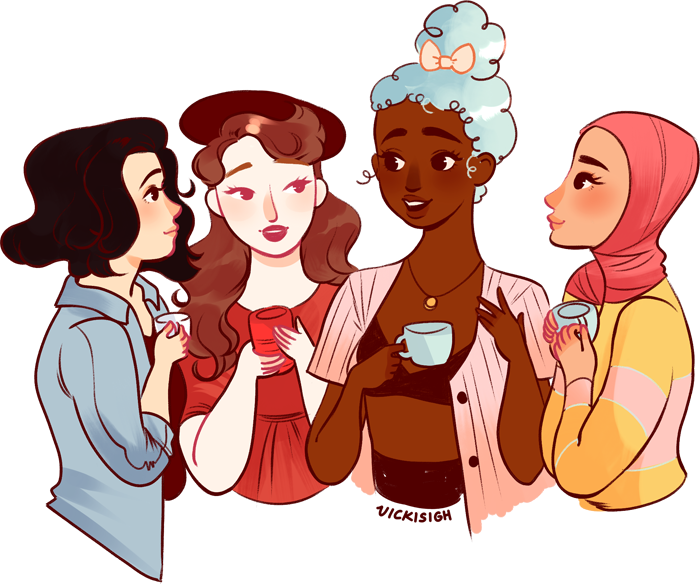 Goes The Reader’s illustrations and Her Story‘s brand new, beautifully diverse look. I had so much fun brainstorming concepts with Vicki and I couldn’t be happier with the final product. Want to see who will be visiting Pop! Goes The Reader this June and July? You can find a complete list of the participants and their scheduled guest post dates below! I sincerely hope you’ll stop by Pop! Goes The Reader this June and July as these thirty-nine women share stories of love, loss, hope and heartbreak and teach us a little about the characters who helped them become the heroines of their very own story. Tremendous! Very much looking forward to this! What a wonderful series! Wow, looks like it’s going to be a fantastic couple of months!